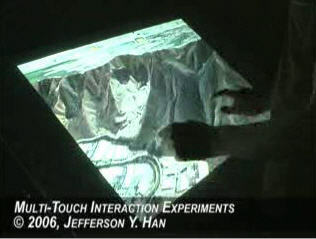 An interesting research prototype of a multi-touch interaction display has been created by a team from New York University Media Research Lab. The team included Jefferson Han, Philip Davidson, Casey Muller and Ilya Rosenberg. The display goes far beyond the usual poking and prodding available on touch screen displays; multi-touch sensing enables the user to interact with the system with more than one finger (or more than one hand) at a time. 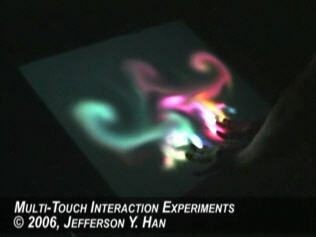 This technique is also force-sensitive (unlike gesture-based displays). The drafting table-style display shown in these pictures measures 36"x27"; it is a rear-projection display with a sensing resolution of better than 0.1" at 50 Hz. He stood behind the three pilots (why, he wondered, did they need so many?) watching the patterns come and go on the great screen that dominated the control room. The colors and shapes it showed were meaningless to him: he assumed that they were conveying information which in a vessel designed for men would have been displayed on banks of meters. But sometimes the screen showed the surrounding star fields, and soon, he hoped, it would be showing Earth. The screen would also show ordinary human-visible scenes of star-fields and planets. 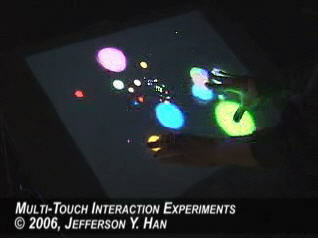 Read more about the Multi-Touch Interaction display screen (and see the cool video). Thanks to wererogue for writing in with the tip on this one.